Malagacar.com is a car rental company located next to Malaga airport with shuttle service for your arrival and departure from Malaga airport. 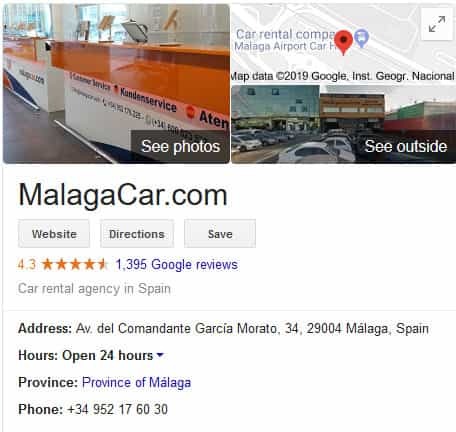 Malagacar.com with over 20 years offering cheap car rentals in Malaga, is considered the industry leader in quality regarding rental vehicles and prices in Malaga and as well in the opinion of customers. When looking for car hire in Malaga with a company that has behind it the trust of thousands of customers, no doubt, Malagacar.com is the company you need. The user must have valid driver's license for more than a year and must provide the international driving permit if he comes from outside the European Union. The minimum age to rent a car with Malagacar.com is 23 years for standard rent, 25 for the minivan and people carrier and a minimum of 27 years for vehicles in the luxury range. You will need a flight number when booking online. Malagacar.com focuses exclusively on providing the best service to users arriving at Malaga airport. If you have any questions, feel free to use their phone service, they always respond friendly, very quickly and concisely. Extras like GPS or child seats are not included in the price. The rating of this company is excellent as can be seen in this image taken in 2019. This rating added and others found online provide a great confidence and guarantee. Malagacar.com is one of the few companies that will not ask your credit card number when booking online. This is a great benefit for anyone looking to rent a car without a credit card in Malaga. To find discount vouchers and useful information about hiring a car in Malaga, follow the next link for the facebook of Malagacar.com, where are distributed online discounts fo customers and newsletters, so we recommend visiting the page and becoming a fan in facebook or sign up for newsletters. With Malagacar.com it is easy to save money without sacrificing quality of service. Visitors of Malagaweb can benefit from our discount voucher for Malagacar.com: HELLOFAN, follow us and them in Facebook for further voucher codes. Updated on March 2019, you can read more Malaga car hire reviews on their website.